(Latest Updated : 31.10.18). HP TET Result 2018 : Check HPTET 2018 Result for LT, JBT, TGT, Shastri, Urdu & Punjabi TET Exam 2018 - Himachal Pradesh Board of School Education (HPBOSE) has declared HP TET Result 2018 for TGT (Arts), TGT (Medical), TGT (Non-Medical), JBT, Punjabi, Language Teacher & Shastri TET Exam 2018 held in Sept, 2018. Himachal Pradesh Teachers Eligibility Test was conducted in September 2018 for HP TET Exam 2018. Result detail is available here. Candidates of HPTET 2018 can see their result of HPTET Exam 2018 at the official website of HPBOSE i.e. www.hpbose.org. Check HPTET TGT Arts Result 2018, HP TET TGT (Medical & Non-Medical) Result 2018, HPTET JBT Result 2018, HP TET LT Result 2018 & HP TET Shastri Result 2018 & Result analysis (pass %) here. Submit Roll No. or Application No. See the result and download it and print for future reference. So. you can download your HPTET Result 2018 as per the instructions cited above. Here is provided the direct link to download the result. HPTET Result 2016 was declared on 07.11.2016 for HP TET Exam 2016 held in September, 2016. The result was prepared on the basis of final answer keys of HP TET Exam 2016. Here is result analysis of HP TET Exam as per every TET Exam (JBT TET, Shastri TET, Language Teacher TET, TGT - Arts, Medical, Non-Medical TET) with total number of candidates applied, appeared and passed with pass percentage (%). Check the HP TET Result Pass Percentage subject-wise. 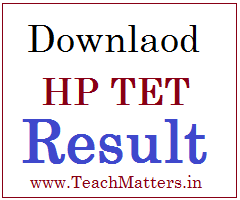 Pass percentage of HP TET Result 2016 is available here.